Studying a thriving labour union in Alberta is a bit like studying an organism that flourishes in scorching, sulfur-laden undersea vents. Until recently, Alberta’s labour protections have been even flimsier than those of most US states. Its rate of unionization is the lowest in Canada. A prominent rural meatpacking plant used to dangle a banner boasting “Proudly Union-Free.” Against these odds, one Alberta union has achieved remarkable wins over the past two decades, especially with organizing new immigrants, refugees, women and youth. 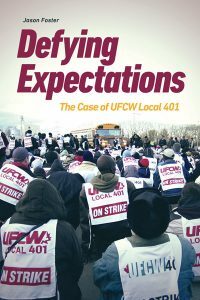 United Food & Commercial Workers (UFCW) Local 401 had a reputation for being a conservative business union, so—as Jason Foster explores in Defying Expectations—what accounts for this organization’s unexpected success? Foster’s background as a professor at Athabasca University and a former staffer with the Alberta Federation of Labour informs how he tells the story of UFCW 401. He begins with a violent 2005 strike at the Lakeside beef-processing plant in Brooks. A wildcat protest by Sudanese workers triggered this job action, which ultimately won a first contract for over 2,000 employees. Drawing on extensive interviews, document analysis and first-hand observation, the first half of the book chronicles Local 401’s improvised evolution from 1997 to 2017 as it becomes increasingly militant. In the second half, Foster critically analyzes the narratives and leadership context that help explain the union’s “accidental” renewal. By offering a rich record of Local 401’s history and a broad theoretical view of how to make unions more effective today, this case study is immensely valuable to academics and the labour movement alike. At the heart of Defying Expectations is an argument to consider unions in their messiness and totality, given their contradictory role of both working within and resisting capitalism. Foster suggests that if we drop pigeonholes such as “business unionism” or “social unionism,” we can better understand unions’ internal logic. For instance, Local 401’s top-down leadership structure belies the image of a social justice union; it’s had the same president since 1989 and lacks formal avenues for workers to voice dissent or join in decision-making. As Foster reveals, the union normalizes this state of affairs by relaying a story about a tough, fatherly figure who acts swiftly in members’ best interests. The book raises thorny questions about participatory democracy versus responding efficiently to capitalist forces. Further, it distinguishes between getting underserved workers to sign union cards and actually transforming the power structures that prop up whiteness and patriarchy. Given the subject, I wish the book had dug into some of the exciting conversations among activists and academics today about how progressive social movements can be better attuned to the intersection of class politics and identity politics. To present a unified front, the labour movement has often downplayed the distinct ways that race, citizenship, disability and other markers of social difference shape workers’ lives. Likewise, I would have welcomed details on how Local 401 successfully unionized migrant workers, who can be deported simply for exercising their rights. But what the book does offer is far more interesting and hopeful than a glorification of Local 401. Defying Expectations portrays an imperfect organization that, despite a harsh political climate, has brought concrete gains to low-wage workers and their families. Simultaneously, it underscores how the North American labour movement might connect with those who stand to benefit most from unionization by redistributing not just profits, but power. —Anelyse Weiler is a doctoral candidate in sociology at the University of Toronto and a scholar with the Trudeau Foundation.